The purpose of allowing a thickness bias option of, e.g. 0.75, would create thinner grid cells near the top, and thicker grid cells near the bottom. 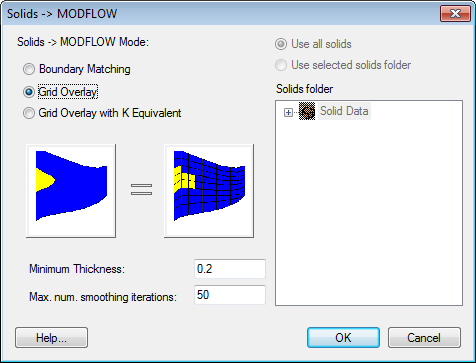 This bias principle is the same when creating a 3D Grid for MODFLOW, and should not be difficult to enable. Currently there isn't a bias control, so it is effectively 1, which creates equal cell thicknesses for all layers at a given grid location. Simply put, there is better geologic data and more interesting GW interactions near the surface, so I would like the grid to be refined near the surface. As a result of more geologic information near the surface, my Solids data are often more detailed near the surface, and less detailed and with less certainty at depth. This level of detail near the surface is neglected with no bias control.